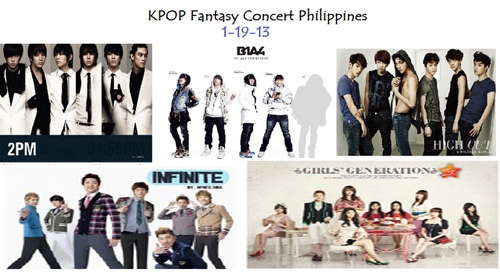 Good news to all KPop fanatics in the country, the "KPop Fantasy Concert Live in Manila" will be set on January 19, 2013. Ms. Happee Sy confirmed the news while EXO group posted it in their official Facebook page that they will attend the said concert. 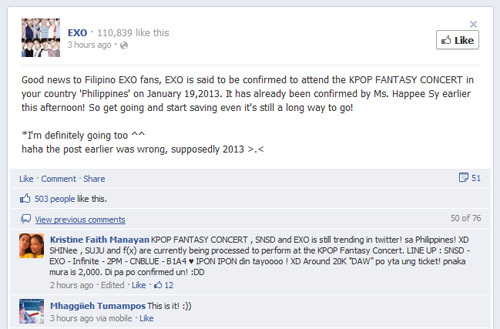 Among the KPop group who confirmed to attend the KPop Fantasy Concert are SNSD (Girls' Generation) and EXO. While some of the korean pop group such as 2PM, Infinite, SHINee, B1A4, f(x) and SuJu are still on negotiation process. Last August 10, 2012, SBS K-POP Super Concert Festival was held in the Home Depot Center in Los Angeles, California, which was been attended by Girls’ Generation, SECRET, SISTAR, MBLAQ, CNBLUE, SHINee, KARA, 2AM and 2PM. For the meantime while you are waiting for further announcement about the KPop Fantasy Concert 2013, please share this post to your friends via Facebook, Twitter and Google+ so they to will be informed. Comments or suggestions about "KPop Fantasy Concert 2013 Live in Manila on January 19" is important to us, you may share it by using the comment box below.